Dr. Mario was one of Mario’s earlier forays in branching out to genres outside of the platformer, and remains a fun and addictive puzzle game to this day. In 2001, as the Nintendo 64 was coming to a close and the GameCube was readying its way to store shelves, Nintendo released a relatively obscure entry in the Dr. Mario series as part of the Nintendo 64’s last breath titled (what else?) Dr. Mario 64. Though Dr. Mario 64 retains the fun of the series, its lack of newness to the formula may mean you’ll only break it out during parties. 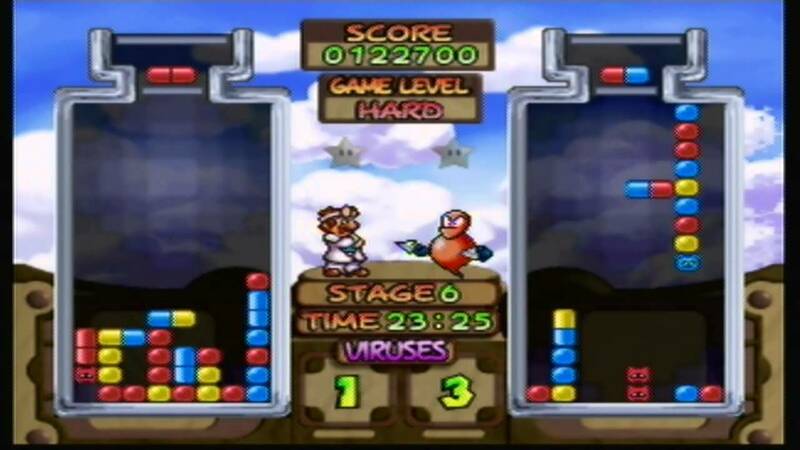 Dr. Mario 64 retains the gameplay of the series: It works like a falling-block game, but instead of blocks, it’s vitamins (or “megavitamins,” as the series calls them). The vitamins are separated in two halves, with either side being red, blue or yellow. Additionally, there are several red, blue and yellow viruses on the game board. Like most falling-block games, the goal is to prevent the vitamins from stacking to the top of the screen by connecting a row of similarly colored vitamins, though unlike other such puzzle games, you don’t simply survive for as long as possible, but you can actually win by by eliminating all the viruses on your board before your opponent. It remains a simple setup, but the gameplay is incredibly addicting. Dr. Mario 64 even adds a story mode to the equation – which can be surprisingly difficult – where players can play as either Dr. Mario or Wario and take on a series of enemies from Wario Land 3, which is a pretty strange crossover, the more I think about it (other than Wario himself, no other characters from the Wario games usually crossover into the Mario series in the way the Donkey Kong or Yoshi characters do). The appeal of the story mode is short-lived, however. The real reason you’ll be coming back to Dr. Mario 64 is for the multiplayer, as this entry allows for up to four players to join in the mayhem. This is where the game really shows its appeal, because other than the added number of players, Dr. Mario 64 really doesn’t add any particularly appealing new modes into the mix (one of the additional modes changes things into the aforementioned “play until you lose” method of the puzzle games of old). On the bright side of things, four-player Dr. Mario is the kind of thing that’s tailor-made for get-togethers with friends. The Dr. Mario gameplay is a whole lot of fun, and playing it with a full-party just makes it all the more entertaining. It’s a shame that the game’s release towards the end of the N64’s life meant that not a whole lot of people got to experience Dr. Mario 64’s multiplayer madness. Dr. Mario 64 has some appealing visuals for what it has to offer, with the character animations being colorful and vivid, and reminiscent of the anime-style puzzle games I used to play in arcades back in the day. Even more notable is the soundtrack. The music tracks are upbeat and energetic, and really add to the frantic gameplay (the final boss in the game’s story mode has a theme that sounds like something out of Secret of Mana). Overall, Dr. Mario 64 may not go down as a classic by any means, but it remains a really fun game to break out for some multiplayer fun. It may be the same old Dr. Mario in a lot of ways, but when you consider that it’s Dr. Mario for four players, it’s hard not to appreciate it. Revisiting one of the last notable N64 games.